I have this thing about ice cream on vacation. I'm not sure why, but it feels like an integral part of the vacation experience to me. I have a ridiculous sweet tooth and love ice cream all the time, but I guess vacation gives me a perfect excuse to indulge repeatedly. All that to say, when multiple people told me that eating gelato every day in Italy was a requirement...well, I had zero trouble signing on. Be wary of colors. Banana flavor should be grayish; pistachio should be a dull green-gray. When these flavors are neon-yellow or bright green instead, it's a good indication that the gelato is full of sketchy ingredients and additives. Be wary of showy displays. 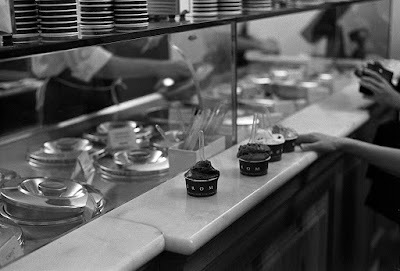 This rule didn't always hold true, but in general, the places with gravity-defying piles of gelato in the display case are probably inferior quality and appealing to tourists. The legit places often keep their gelato in metal tubs with lids. The other unusual thing is that often the ordering process is the exact opposite of what you'd expect in the U.S. Here, it's common to order your ice cream, then take your cone to the cashier and pay. In Italy, sometimes that's the case, but just as often, you go to the cashier first. This especially seemed to hold true in bigger, busier places. Once you've paid, you take your receipt to the counter and order the flavors you want. Sadly, I hardly got any photos of our gelato, in spite of the fact that we really did have it every day except one. I was so careful to take pictures of every restaurant and all the courses of all our meals, but I guess I was too excited about eating my gelato to stop and take a picture of it. A couple of other quick notes: first, this website was really helpful for decoding common flavors. I was surprised to find that almost all the flavors seemed milder or more subtle than I expect from American ice cream. Also, interestingly, the fruit flavors are actually sorbetti, not gelati, because they are made without dairy. Part of me was disappointed with this--I'd never think of ordering sorbet instead of ice cream here at home--but the fruit flavors were SO rich and smooth and delicious that I didn't really miss the dairy. Hedera, Borgo Pio 179 - The first authentic-looking (metal tubs with lids) place we found, tucked in a corner of the most charming, Italian-looking side street near Castel Sant'Angelo. So of course it holds a special place in my heart. I can't remember the second flavor I ordered, but stracciatella (similar to chocolate chip) was the first. My first impression was that the flavors--I sampled four or five--didn't knock my socks off. Panna & Co, Via Marmorata 115 - We stopped in this Testaccio gelateria for an after-dinner treat on our way across the river. The combination of cioccolato (chocolate) + fragola (strawberry) was spectacular. Flor, Piazza Campo de’ Fiori 51 - Some of my very favorite gelato of the trip. The caffe (coffee), fior di latte (literally "flower of milk"--a basic sweet cream), and frutti di bosco ("fruits of the forest"--mixed berry) were all amazing. Pompeii - Just so I could get my daily gelato in, we stopped at a little stand on our way out of the ruins, near the train station, for a cone of caramello + caffe. Covo Dei Saraceni, Via Regina Giovanni 5, Positano - This hotel on the waterfront had a yummy cocco plus a flavor called delizia al limone--lemon with, if I recall correctly, cookie/cake pieces or something in it. Vivoli, Via dell’Isola delle Stinche 7/r - After discovering in the Napoli train station that gianduia essentially meant "Nutella" (chocolate hazelnut), I had to try this flavor when I spotted it. Great choice. Grom, Via del Campanile 2 - We had been told this was THE gelato to have in Firenze; it did not disappoint. The crema di Grom was not quite what I expected (the cookies were cornmeal-based! ), but good. I especially liked the pesca (peach) and lampone (raspberry)--and they were great together. The caffe was very strong and not very sweet, which Steve loved (not my favorite). Peach + raspberry. See how teensy the cup and the spoon are? Festival del Gelato, Via del Corso 75 - This one breaks all the rules: crazy displays, neon sign, dozens of flavors--it's definitely not an out-of-the-way place you're going to discover--but it's definitely worth a visit. It had lots more flavors than other places, beyond the Italian classics we'd come to expect. I tried Snickers and strawberry cheesecake, and both were fabulous; I also had a bit of what I thought was going to be like Fantasia's duplo, but it wasn't what I expected. 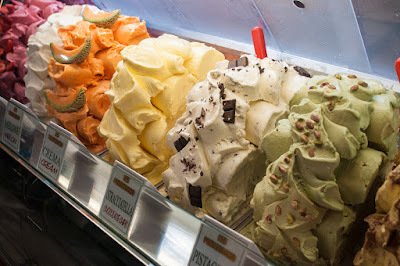 Ahh...I miss my daily gelato. Ditto what Danielle said. This was, of course, the first Italy post of yours I've read. So telling. Like you, I have a near ferocious sweet tooth and could talk or read for hours about all foods sweet. You and I would make a fine pair visiting all the gelato places and flavors! I'm wondering about texture. Is it similar to icecream here in the states?